W. P. Carey Inc. (WPC) is an independent equity real estate investment trust. The firm also provides long-term sale-leaseback and build-to-suit financing for companies. The company not only invests in triple-net lease properties throughout the world, but it also managed privately held REITs. As a result, its sources of revenues are derived from the stable and recurring rents from those properties, which are usually leased to tenants under long-term leases. Those triple-net leases also allow for rent escalation over time. Under a triple-net lease, the tenant is required to pay all expenditures associated with maintaining and operating the property under lease. W.P.Carey raised its quarterly dividend to 99.50 cents/share. This REIT is a dividend achiever which has rewarded shareholders with a raise for 20 years in a row. 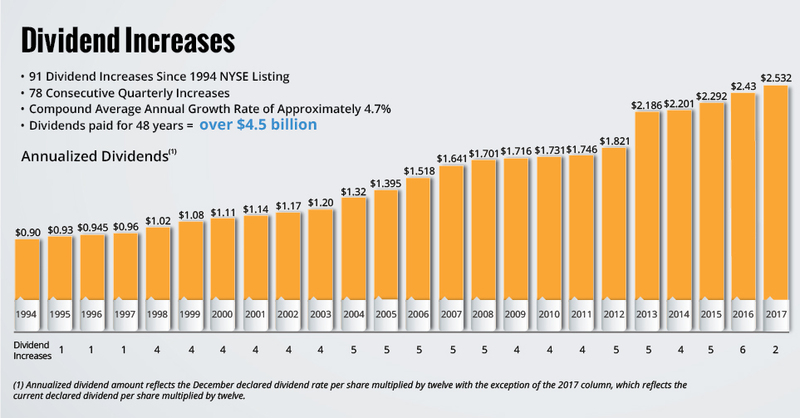 The ten year dividend growth rate is 8.10%/year. FFO/share increased from $3.34/share in 2007 to $4.86/share in 2016. 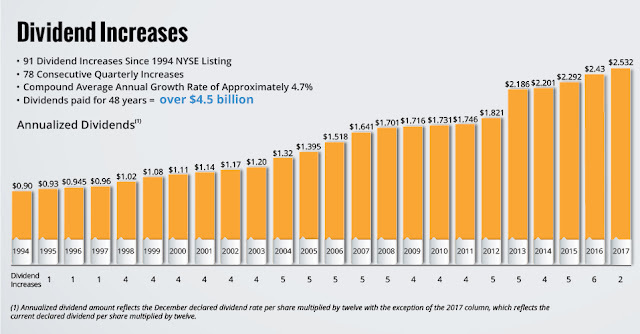 I would be surprised if annual dividend growth exceeds 3% - 4%/year over the next decade for W.P. Carey. This REIT is cheap at 12.80 times FFO and yields 6.40%. Check my analysis of W.P. Carey for more information about the REIT. The main risks behind REITs are rising interest rates, which could make cost of capital more expensive. In addition, it would make it more expensive to be rolling debt that is maturing. On the other hand, rising rates coupled with increased economic activity may be bullish for real estate, and offset the effect of increasing interest rates. In the case of W.P. Carey, there is also an additional risk with foreign revenues, whose exposure is hedged.